↑ "Secrets of Senna's black box". Senna Files. www.ayrton-senna.com. 1997-03-18. Retrieved 2006-10-28. ↑ BBC (2006-02-17). "Circuit Guide - Imola". BBC News. Retrieved 2010-01-01. ↑ The Guardian (2003-03-03). "Imola, San Marino". London. Retrieved 2010-04-26. ↑ "San Marino loses Grand Prix race". news.bbc.co.uk. 29 August 2006. Retrieved 2008-03-27. ↑ "Imola hopes to get back on 2007 calendar". f1.gpupdate.net. 30 August 2006. Retrieved 2008-03-27. ↑ "Imola receives '1T' FIA rating". en.f1-live.com. 30 August 2006. Retrieved 2008-09-02. 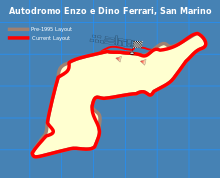 Wikimedia Commons has media related to Autodromo Enzo e Dino Ferrari. This page was last changed on 8 September 2014, at 21:48.